Apprentice jockey Tina Comignaghi won the Ashlee Mundy Memorial Jockeys’ Choice Award last season in the South Island, an honour that included a sponsored trip, courtesy of New Zealand Thoroughbred Racing, to the North Island. Apprenticed to John & Karen Parsons at Balcairn, North Canterbury, Comignaghi has spent the past week at Ballymore Stables, with trainers Mike Moroney & Pam Gerard, in Matamata. “It was really good, fantastic, I loved it, and very different for me to gain experience at a training centre that size,” Comignaghi said. 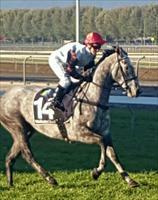 Amongst seven race day rides on her working holiday, Comignaghi bagged a second and third in four rides for Ballymore. The third came aboard Captain Risky (Rip Van Winkle) last Wednesday at Avondale, while her second on debutante Fly to the Moon (Reliable Man) over 1200 metres was a highlight performance today at Matamata. In particularly good form this season with 26 wins (including two stakes victories about Courte Zarindi (Any Suggestion)) in a total of 50, Comignaghi grew up in Buenos Aires, the capital of Argentina. “It was great to have her up here,” Gerard said. “She was unlucky to get beaten today on Fly to the Moon, but the post just came up a stride too soon.